To view a larger image of a turtle, please click on its picture. 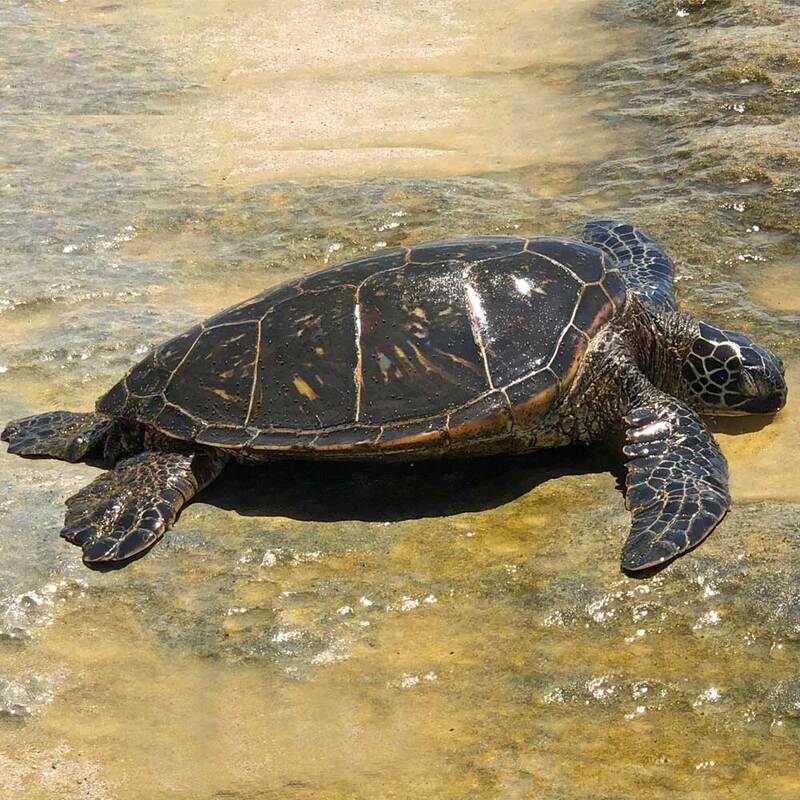 To view more information about a specific turtle, please click on their designation number, such as L-01. 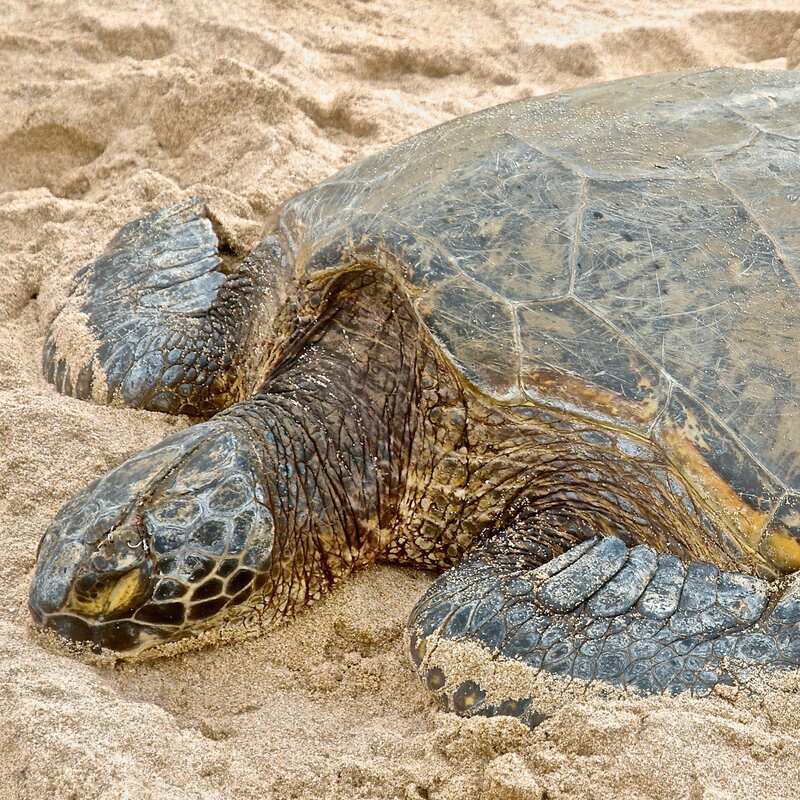 Brutus, a 45 year old adult male, was one of the first turtles in 1999 to repeatedly bask in the sun at Laniakea Beach. Weighing approximately 166 pounds at the time, L-1 was the first turtle to receive PIT ( Passive Integrated Transponder ) identification tags in his rear flippers. It was on a blustery March 15th evening that he first came ashore, having lost half of his back flipper to a tiger shark. His arrival and name are ironically reminiscent of two famous lines from Shakespeare's play "The Tragedy of Julius Caesar": "Beware the Ides of March" and "Et tu Brute." Over the years he has been hooked, entangled, and nipped by predators, yet trusting enough to continue basking at Laniakea. He has lived up to his Hawaiian name, Nalukai, "the one who has endured the storms of life." Brutus for many years was the most frequently basking turtle at Laniakea; hence, he is known to visitors from around the world. Unfortunately, he has not been seen at Laniakea since April 2014. Hiwahiwa, approximately 45 years old, is a healthy adult female. L-2 has a fissure or "crack" on the top of her shell resulting from an old injury, which took place in 2001. The fissure has completely mended from inside the turtle's body. No one knows for sure what caused Hiwahiwa's injury; however, most likely she collided with a speeding boat or jet ski. A veterinarian repaired Hiwahiwa's shell with an acrylic dental patch. In June of 2002, Hiwahiwa surprised everyone when she was seen nesting and laying eggs 500 miles northwest of Laniakea at the French Frigate Shoals. L-2 migrated again during the 2010 nesting season. After 32 days at sea, Hiwahiwa arrived at the French Frigate Shoals and laid her first clutch of eggs on June 10th. Data harvested from L-2's TDR ( Time Depth Recorder) reveals she made a record-breaking open ocean night dive of 570 feet (174 meters , the deepest in Hawaiian green sea turtle history. Even though she was not on the ocean floor, scientists theorize Hiwahiwa may have been feeding on mid level pyrosomes. Her last satellite signal was received on August 5th and hope faded that she would return to her feeding zone on Oahu. On September 6th, L-2 hauled onto the sand at Laniakea Beach, her satellite antennae broken off. 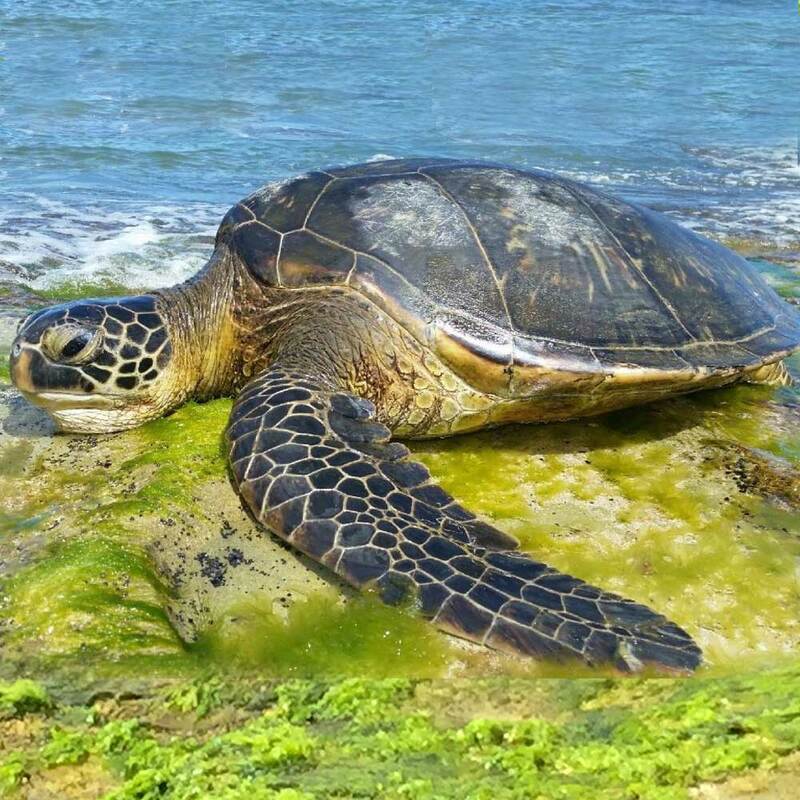 Hiwahiwa basks year round at Laniakea. In April 2017, Hiwahiwa again embarked on a nesting migration to the French Frigate Shoals. She was recorded by NOAA as the 32nd turtle to nest at East Island that year. Sapphire, an adult female approximately 40 years old, is recognized by her beautifully rounded carapace (shell). Sapphire basks on an irregular schedule, usually skipping late fall and early winter months. During the 2008 nesting season, Sapphire completed the 1000 mile migration to the French Frigate Shoals, departing Laniakea in April and returning in August. In March 2012, a satellite transmitter and Time Depth Recorder were attached to her shell by marine scientists from NOAA. Satellite tracking indicates she stayed close to the North Shore of Oahu, rather than migrating. Basking records and confirming information received from NOAA indicates that Sapphire visited the nesting grounds again in 2015. True to her recent basking pattern, she did not immediately return to bask at Laniakea after nesting, but took her normal early winter hiatus. Late January 2016 saw her return to basking at our beach. 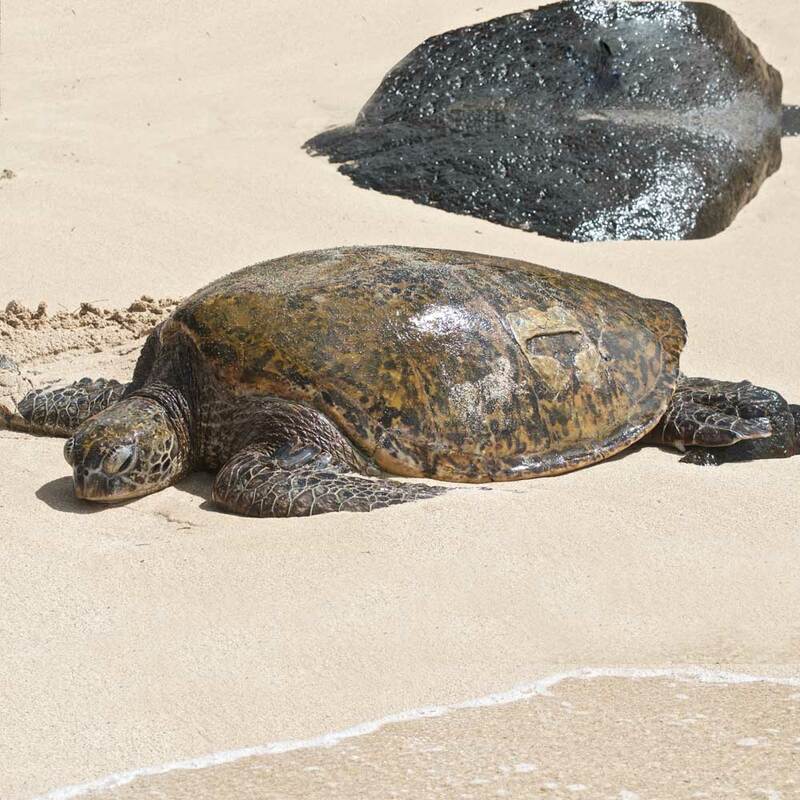 Olivia-Dawn, a large adult female, normally spends 1/3 of her days basking in the sun at Laniakea Beach. 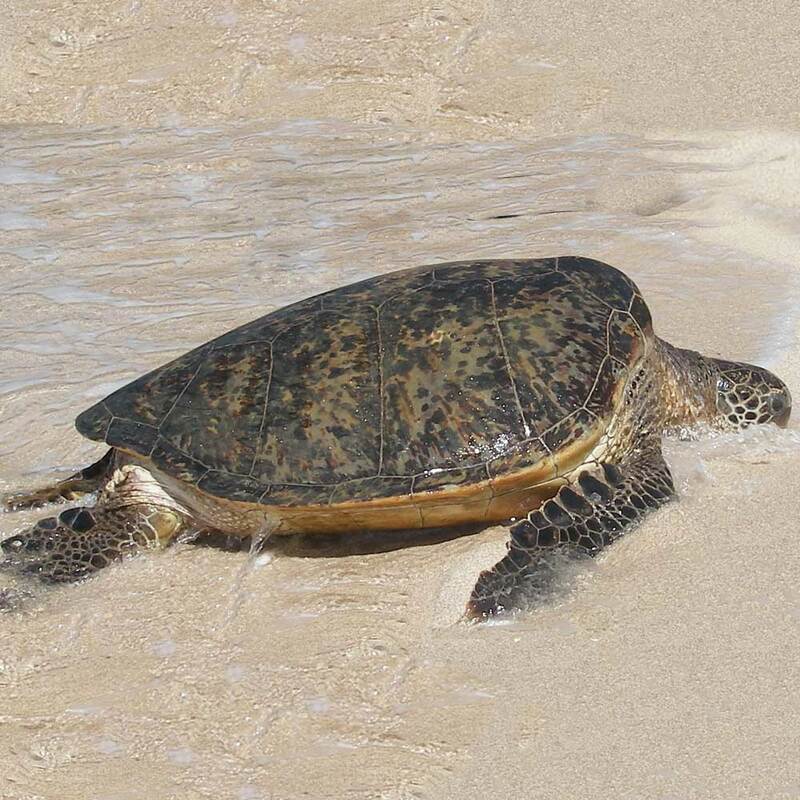 In 2004, L-4 migrated to the nesting beaches of the French Frigate Shoals, departing Laniakea Beach on March 13th. It took Olivia 35 days to swim 500 miles. During the first 20 days of her migration, she averaged 16 deep ocean dives each evening, with the maximum depth of one dive recorded at 443 feet (135 meters). Olivia returned safely to her feeding area at Laniakea on September 17th, 2004. Almost 11 years passed before Olivia-Dawn returned to the French Frigate Shoals to nest again. 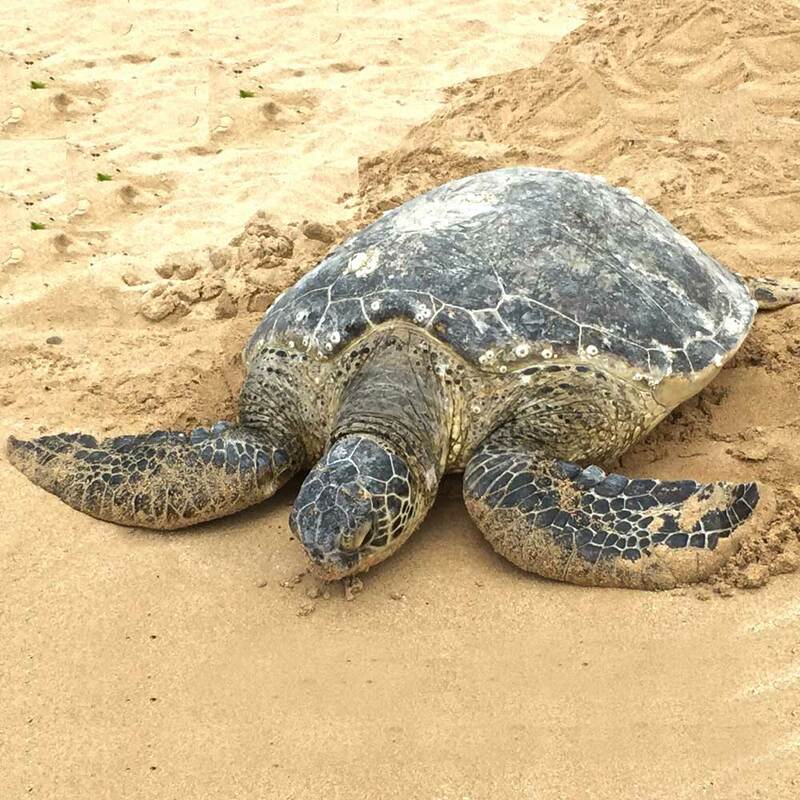 She left Laniakea in April 2015 and returned to our beach on September 8th, 2015. She had the number 101 painted on her shell indicating she was the one hundred first of over 850 turtles recorded as nesting at the Shoals this year. Isabella, in 2007 and 2011, completed the 1000 mile round trip journey to the nesting beaches of the French Frigate Shoals. She normally has many more barnacles (currently over 100) attached to her very rounded shell than any of our other basking honu. Her basking is infrequent; she can disappear from Laniakea for more than six months at a time. Oakley is approximately 34 years old. 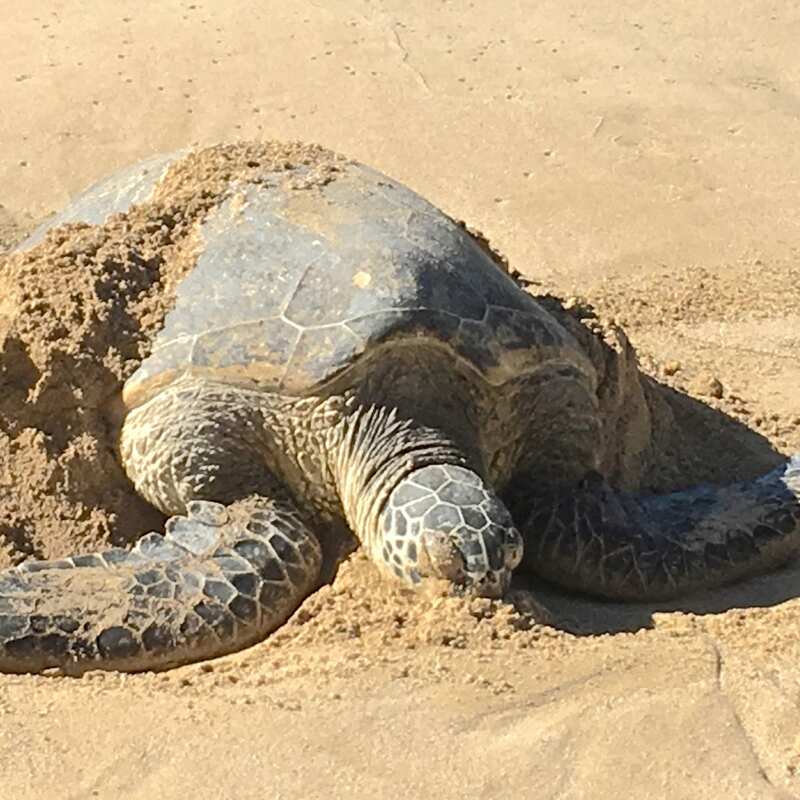 Although one of our top ten most frequently basking turtles during the course of a year, Oakley does not haul out onto Laniakea Beach year round. He basks primarily from February through July or August and then disappears from our shores until the following year. He is one of our turtles that is prone to acquiring barnacles during his absence from Laniakea. Basking records suggest that he may have visited the French Frigate Shoals nesting area in 2014 and again in 2017. 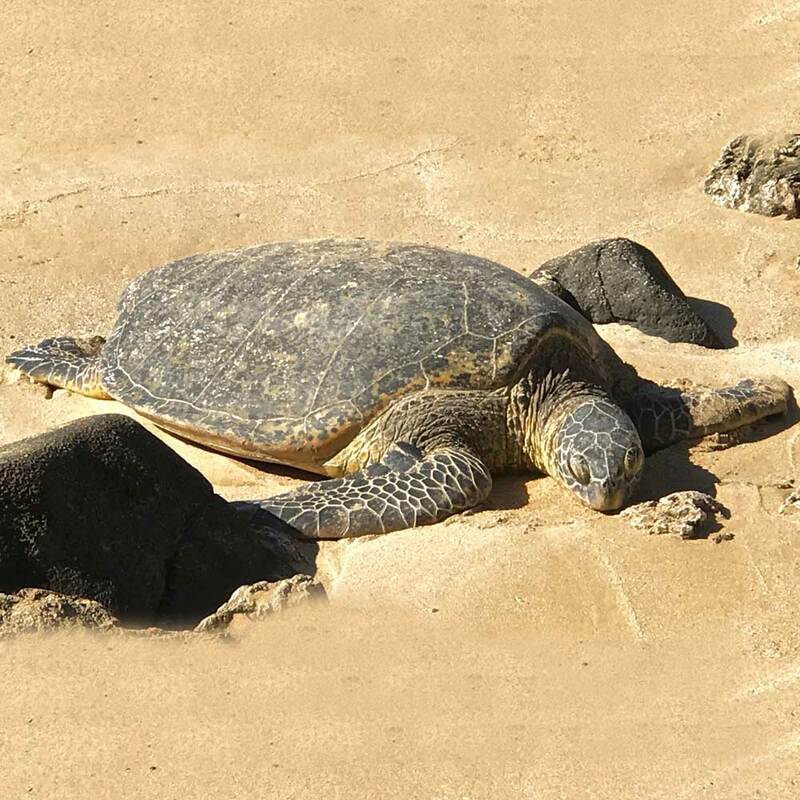 Wooley Bully, one of the largest males to bask at Laniakea Beach, is approximately 40 years old. One third of his left rear flipper is missing as the result of a shark attack. In 2004, L-7 completed a 1000 mile round trip migration to the mating and nesting areas of the French Frigate Shoals. He swam to the isolated atoll in 25 days and returned hastily to his feeding grounds off Laniakea Beach in only 21 days. 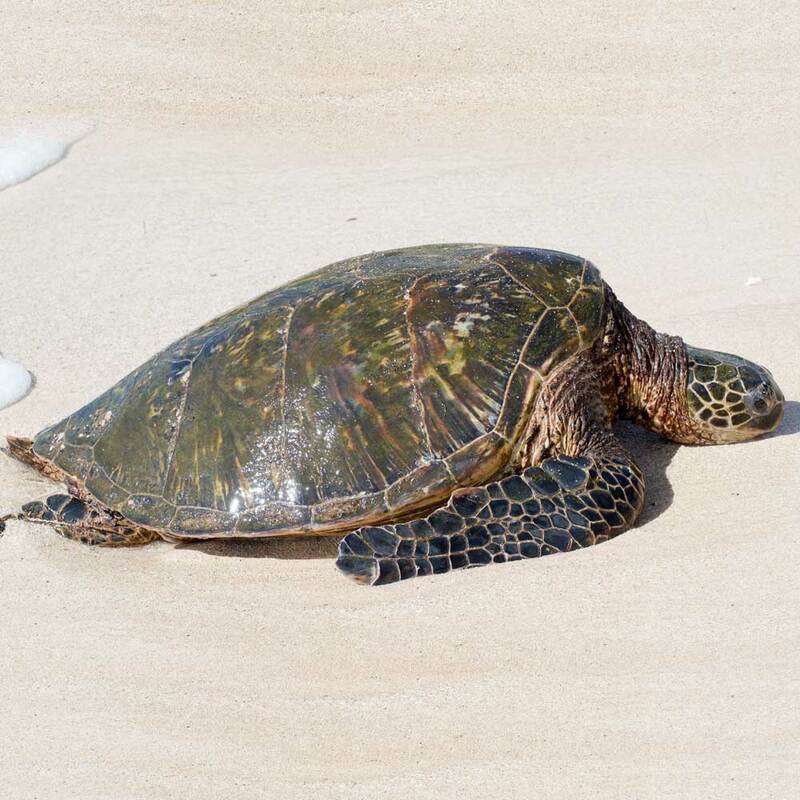 Since NOAA only recently began recording the appearance of male turtles at FFS, no record exists of his migration activity in the intervening years. However, in 2017, after an uncharacteristic absence from Laniakea during the spring and early summer, he returned on July 5th evidencing "mating scars" from the combat that occurs between males at the nesting grounds (all the scars have since healed). Hence, it is highly likely that Wooley was at FFS again in 2017. Wooley-Bully is another of our turtles that does not bask at Laniakea year round, usually disappearing during some of the winter months. KUAI is Laniakea's elusive adult female night basker. L-8 sometimes hauls out onto the sand at dusk and is rarely seen on the beach during daylight hours. Since the last 3 digits of Mahina's PIT tag numbers are 720, she was named after the call letters of Kauai's radio station 720-KUAI, which broadcasts nightly from the Garden Isle of Kauai to the North Shore of Oahu. Mahina has not been seen on the beach since July 2012. Squirt was one of the first young subadult baskers to begin coming up at Laniakea in 2003. Approximately 30 years old, L-10 has a distinctive way of hauling out onto the beach by arching high on his front flippers. In 2008, his tail began noticeably growing longer and thicker, confirming his male gender. Called Lele, L-10 has both the left and right medial scutes missing, but healed, on either side of his tail. 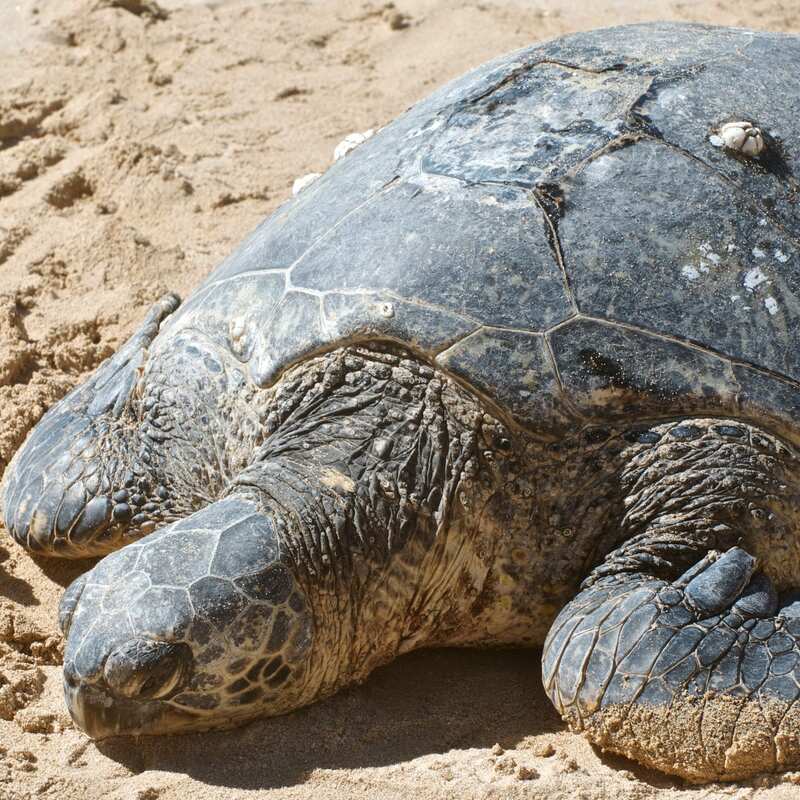 Although no longer basking at Laniakea, Lele is still alive and well, basking at a beach nearby, as he stopped in for a brief visit in January 2014 after a 2 1/2 year hiatus. 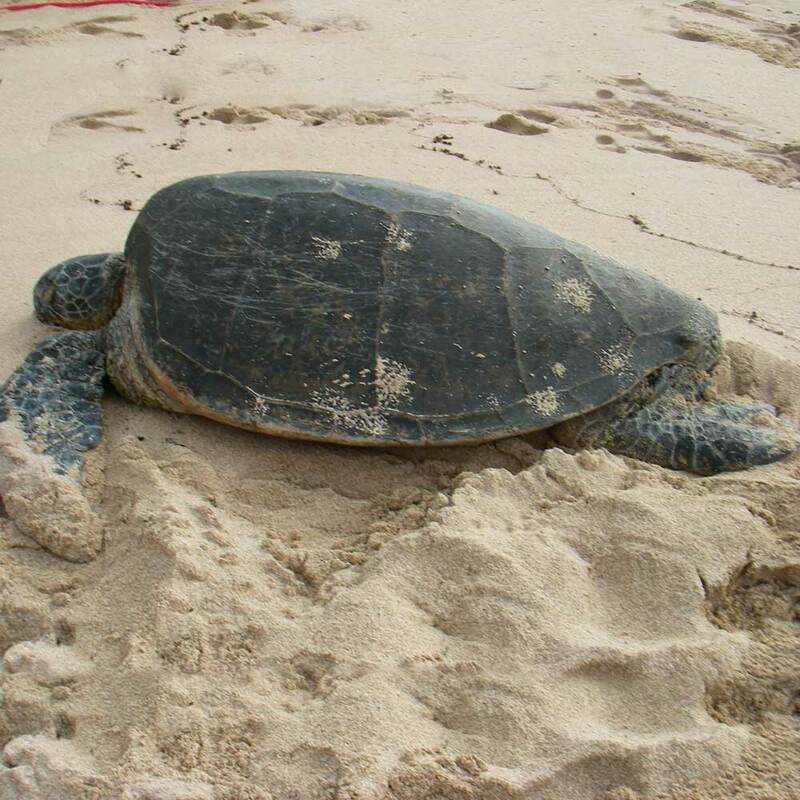 Genbu, distinguished by a markedly flat scute on top of his shell, disappeared from the shores of Laniakea in 2004. A year later he hauled out onto the beach with a large fibropapailloma tumor on his left jaw hinge and tumors on his neck and eyes. He was successfully treated by a veterinarian with Dermex in 2005 and again in 2007. In 2009, Genbu again disappeared for eighteen months. He returned to Laniakea in 2011 with over 20 barnacles on his shell. Genbu, outfitted with a satellite transmitter and Time Depth Recorder, completed a migration to the French Frigate Shoals nesting beaches between March and July of 2012. Unfortunately, Genbu has not been seen at Laniakea since June, 2014. Missy, also known as Kauila, is a large adult female. In 2004, she was seen 500 miles from the North Shore of Oahu on Little Gin Island in the Northwest Hawaiian Islands. Although not confirmed, it is likely that she was nesting. In 2012, basking records suggest that she may have again migrated to the French Frigate Shoals nesting grounds, possibly back to Little Gin Island. 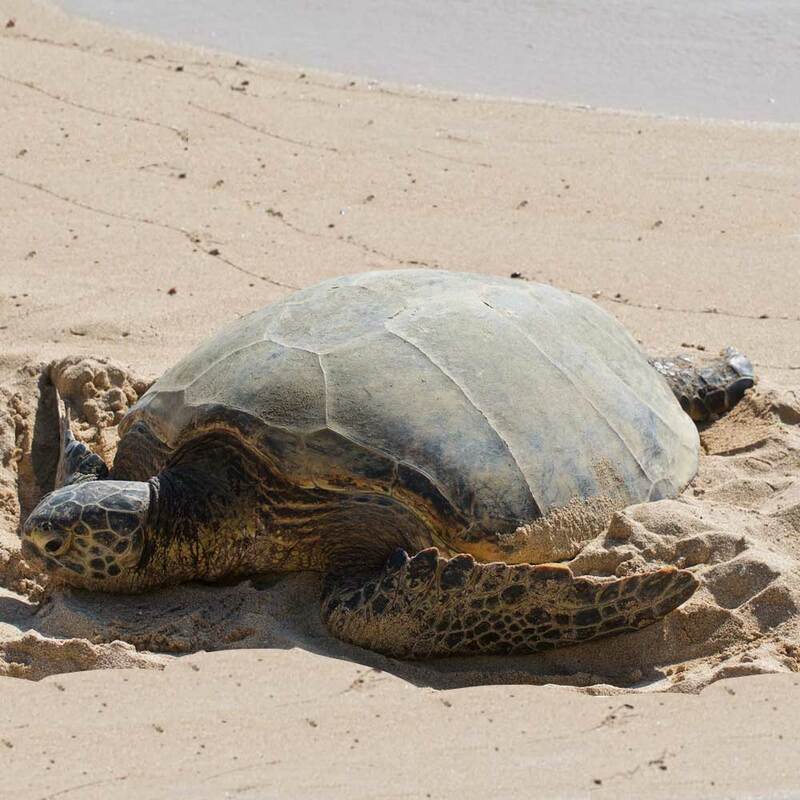 Mana, is a large adult female over 60 years old and the oldest turtle basking at Laniakea. Mana first received four metal flipper tags while nesting on Whale-Skate Island in the French Frigate Shoals in June, 1988. She was confirmed as nesting there again in 1991. Whale-Skate Island is now submerged. In 2004, outfitted with a Time Depth Recorder to collect data for scientists on diving and basking behavior, she again migrated and nested at the French Frigate Shoals. Mana's last confirmed nesting was at East Island in the French Frigate Shoals in 2006. She still has one of the original metal flipper tags remaining on her left front flipper. Pukalani was one of Laniakea's largest female adult baskers and first became known to NOAA scientists in 2000 when spotted nesting on East Island in the French Frigate Shoals. 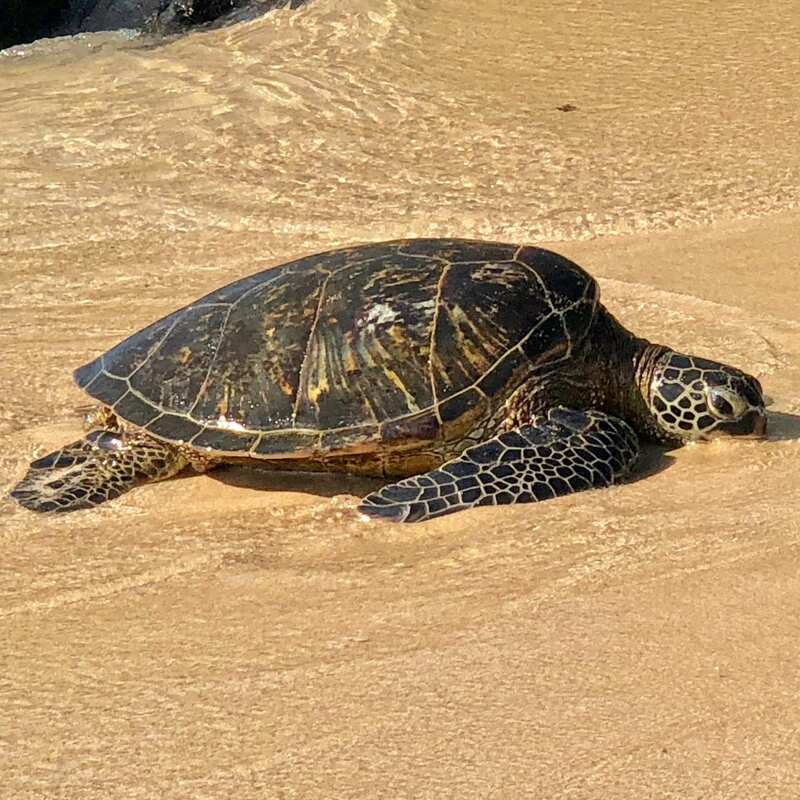 For many years, L-18 enjoyed feeding on the limu ( algae ) between Pu'ena Point and Laniakea, and was frequently seen basking in the sand along this 2 mile stretch of Kawailoa Beach. 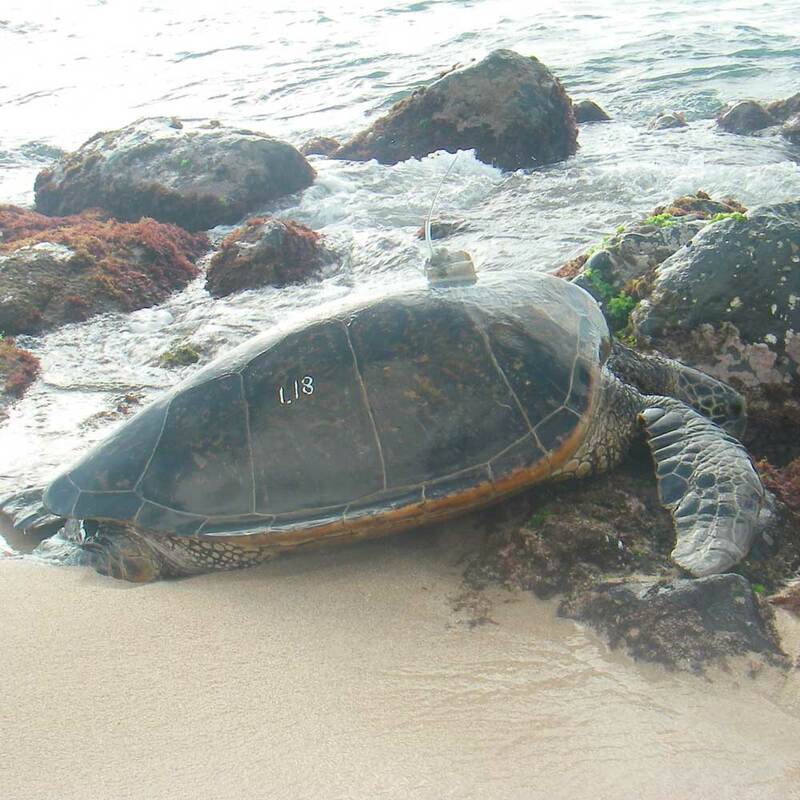 In February 2008, NOAA scientists attached a satellite tag and Time Depth Recorder to Pukalani's shell. 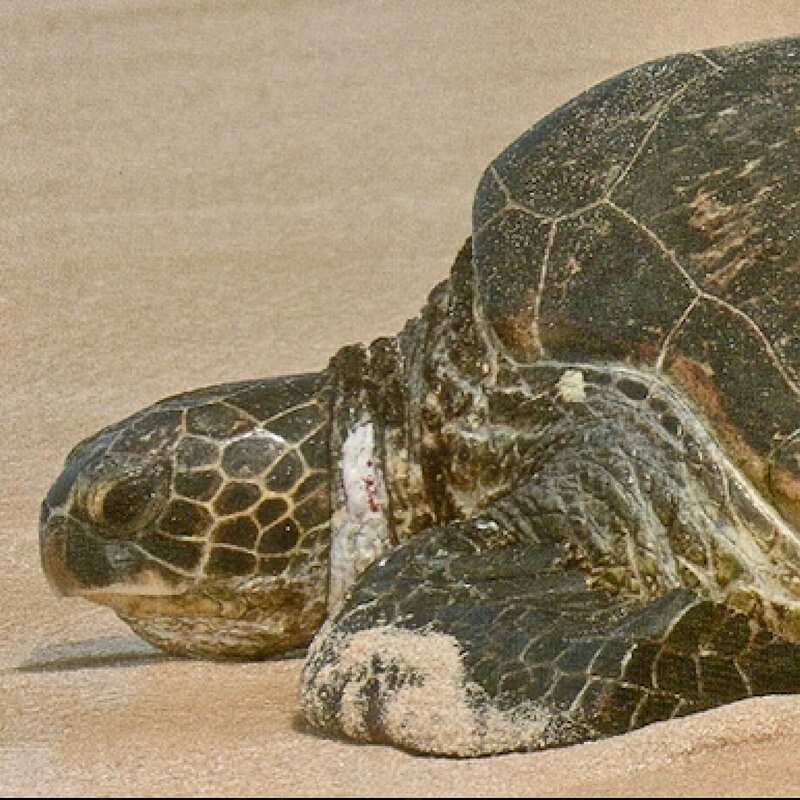 On April 7, 2008 she departed Laniakea, becoming the first Hawaiian green sea turtle to be tracked by Argos satellite telemetry from the feeding area of the North Shore of Oahu, to the nesting beaches of the French Frigate Shoals. After 29 days, L-18 arrived at the French Frigate Shoals. On May 30th, observers noted that Pukalani's left front flipper had been amputated, presumably by a tiger shark. Depite the disability, Pukalani successfully nested on June 10th. A few days later, her satellite tag ceased transmitting and she has not been seen again at Laniakea. Scallop has an irregular "scalloped" edge on his shell just to the right of his tail. On July 14, 2013, Scallop suffered serious head and left flipper injuries, most likely the result of a boat propeller strike. After emergency surgery requiring three weeks of rehabilitation, Scallop was returned to Laniakea in mid August where he basked almost every day until the end of October. He was last seen on the beach after sunset on October 27, 2013. 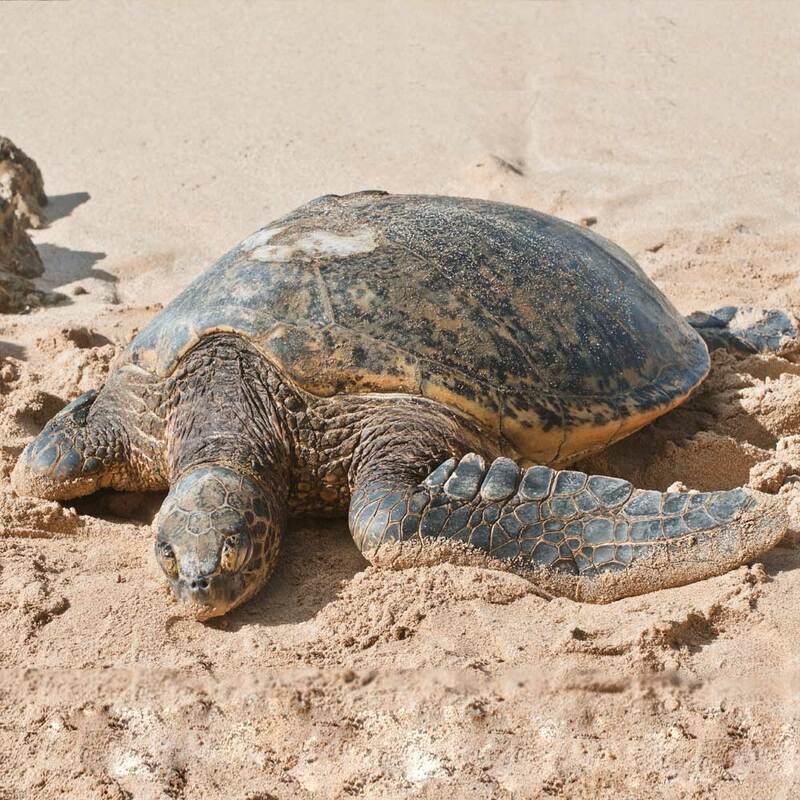 Honey Girl, approximately 35-40 years old, began regularly hauling out onto the North Shore beach in 2005. As the largest adult female turtle of our Laniakea Ohana (family), Honey Girl weighed approximately 250 pounds and had a carapace length of over 37 inches (94.5 cm). Before coming to Laniakea, L-20 was known to the marine scientists on East Island in the French Frigate Shoals, the largest atoll in the Northwest Hawaiian Islands. In 2000 she had migrated 500 miles from Oahu to East Island to mate and nest. While there, the researchers implanted a microchip, the size of a grain of rice, into her left hind flipper. This PIT ( Passive Integrated Transponder) allowed the scientists to identify her throughout the Hawaiian Archipelago, as she migrated from the foraging areas of the Main Hawaiian Islands to the nesting beaches of the Northwest Hawaiian Islands. 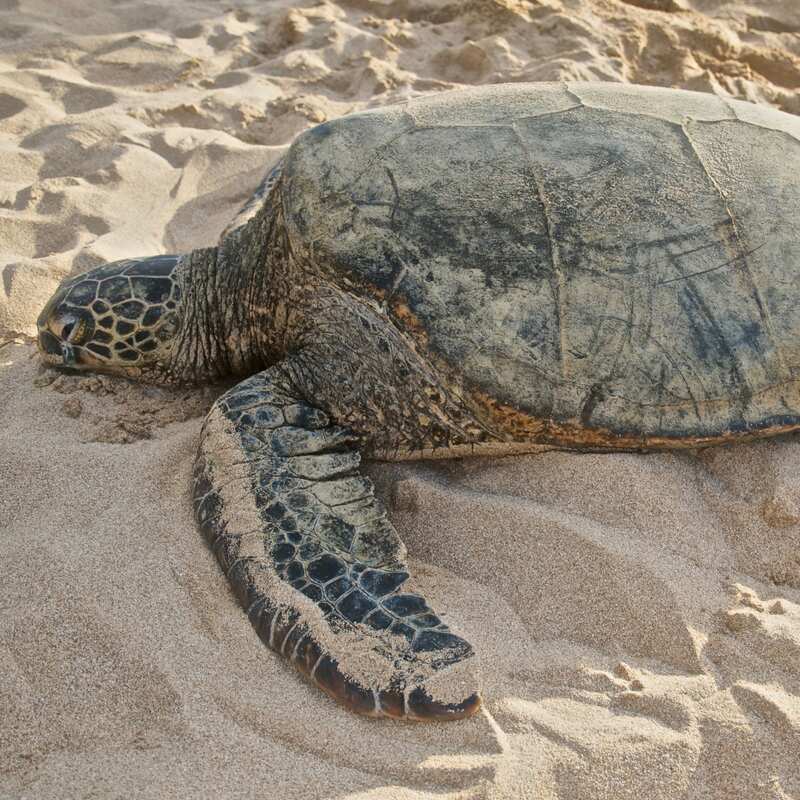 Honey Girl was also known by her Hawaiian name of "Hone U'i" because of her exquisite honey amber shell and L-20, as she was the twentieth turtle to repeatedly come ashore at Laniakea to bask. 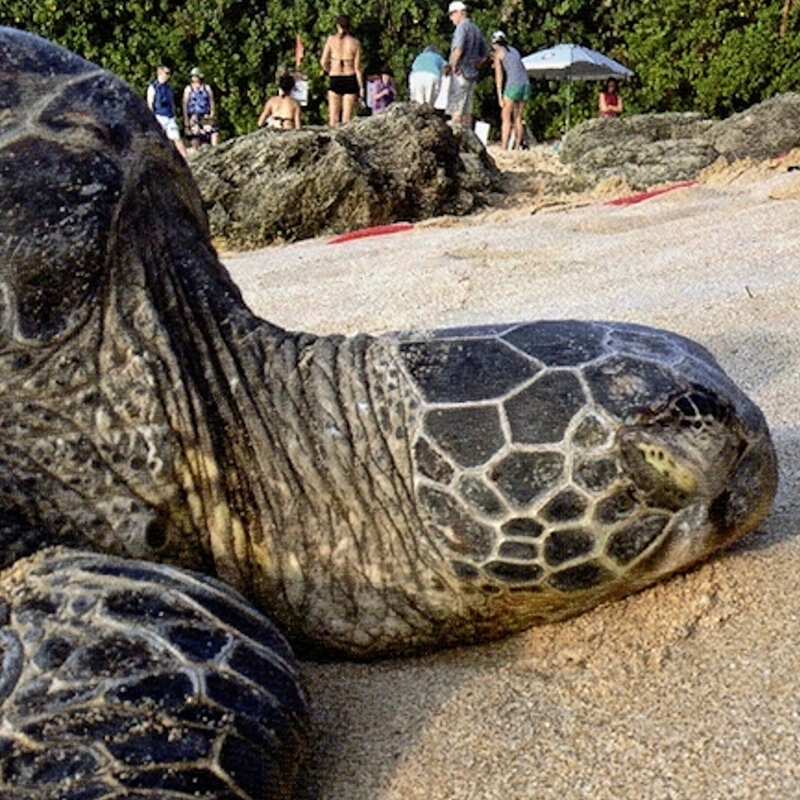 Data collected by the dedicated Malama na Honu volunteer Honu Guardians reveals that Honey Girl basked on the beach 11% of each year at Laniakea Beach. On July 19, 2008 Honey Girl was discovered slaughtered at Laniakea Beach. She had been buried in the sand upside down, with a flipper and breast plate maliciously removed. The evening before, this innocent, defenseless turtle had been basking under the full moon. Punahele is an adult female approximately 35 years old. She can be found basking at Laniakea about 4 times a month year round. L-21 has a faint quarter-sized crescent-shaped indentation on the 2nd right lateral scute of her carapace. Tripod, an adult male approximately 35 years old, basks occasionally in the summer on the exposed coral shelf on the southwest side of Laniakea Beach. His right rear flipper is missing, presumably amputated as a result of entanglement with monofilament fishing line. Nohea Kamakana no longer basks regularly at Laniakea. He has been seen in the area, basking in front of Jocko's surf break, about a 1/4 mile north of Laniakea. Kuhina is our largest male basker approximately 40 years old. L-24 first came up on Christmas Day 2007 and we called him Kalikimaka and Kahuna Nui because he was so big. A Kamehameha School Hawaiian language specialist informed us that it was disrespectful to refer to anyone other than a real Kahuna as a kahuna. He suggested we change the name to Kuhina (the ambassador). Kuhina is currently on hiatus from Laniakea. His last appearance was on March 13, 2015. It is believed that L-24 probably migrated to the nesting area at the French Frigate Shoals but never returned. Keoki was named in honor of George Balazs, former leader of the NOAA Marine Turtle Research Program and the single person most responsible for saving the Hawaiian Green Sea Turtle from extinction. Mr. Balazs founded the original Show Turtles Aloha Program at Laniakea. Keoki has a very rounded shell and a visible "claw" and notched quarter-sized half-moon missing piece from his left rear flipper. L-25, an adult male, usually basks on the luscious green limu/coral shelf on the southwestern side of Laniakea. For several years L-25 was misidentified as a female and named "Clawdette." After nearly a year's absence he hauled out onto the beach in March 2014 with a surprisingly long, thick tail indicative of an adult male. Kekoa first came to bask at Laniakea as a 10-15 year old juvenile in March 2010. 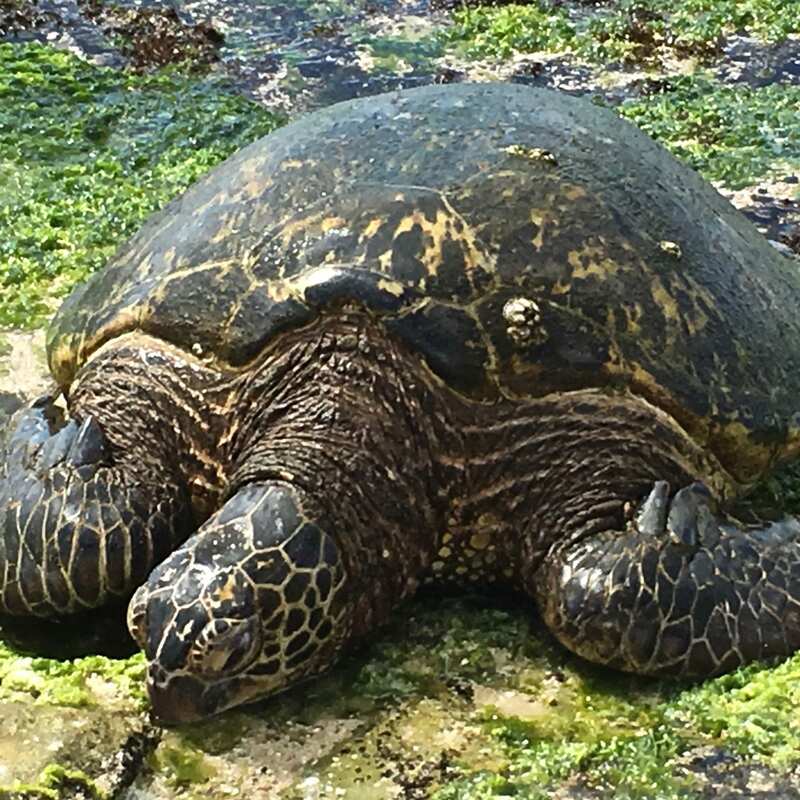 Now a subadult in the 19-24 year range, L-26 has become one of our most frequently basking honu. Kulihi first appeared on the beach in July 2010 with a large fishing hook in his neck. 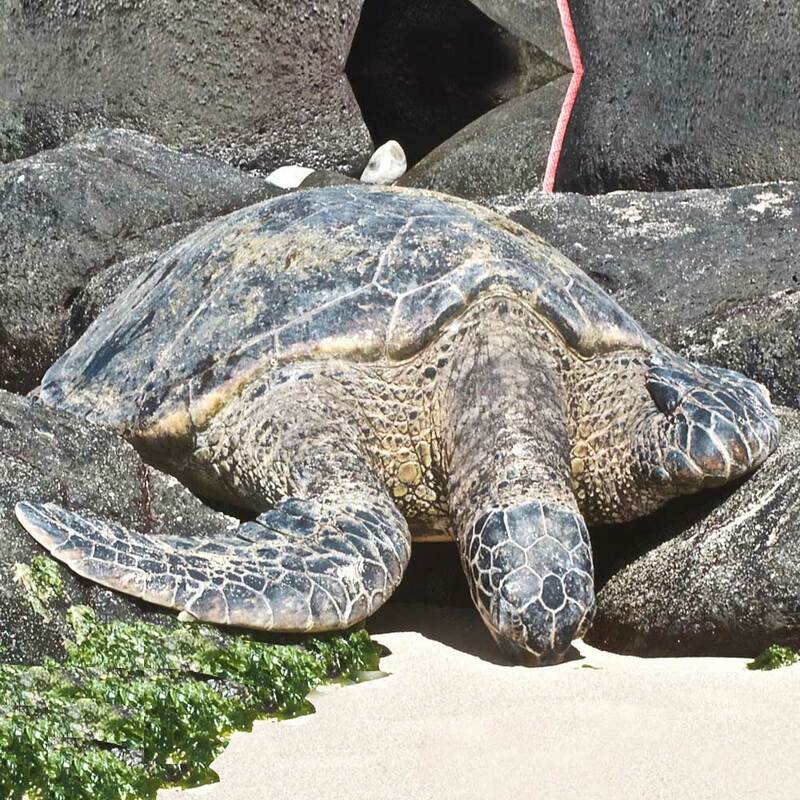 Through the efforts of the Honu Guardians, NOAA`s Marine Turtle Rescue Program, a Kaneohe veterinarian and the Waialua firemen, Kulihi was rescued, treated and released at Laniakea. In June 2017 L-27 was again hooked, this time in his left front flipper, and seriously entangled in fishing line. Quick action by Guardians to disentangle his flippers enabled NOAA to expeditiously extract the hook, treat his injuries and release him back into the ocean at Laniakea the next day. Kulihi is approximately 39 years old and has lately become a more frequent basker at Laniakea. Hao first arrived at Laniakea Beach in the summer of 2010 as a subadult and was named in honor of legendary surfer Andy Irons. In 2012 a NOAA science team confirmed that Hao is a maturing female approximately 30 years old. She exhibits the unusual behavior of gnawing on other turtles' flippers, tails and shells. 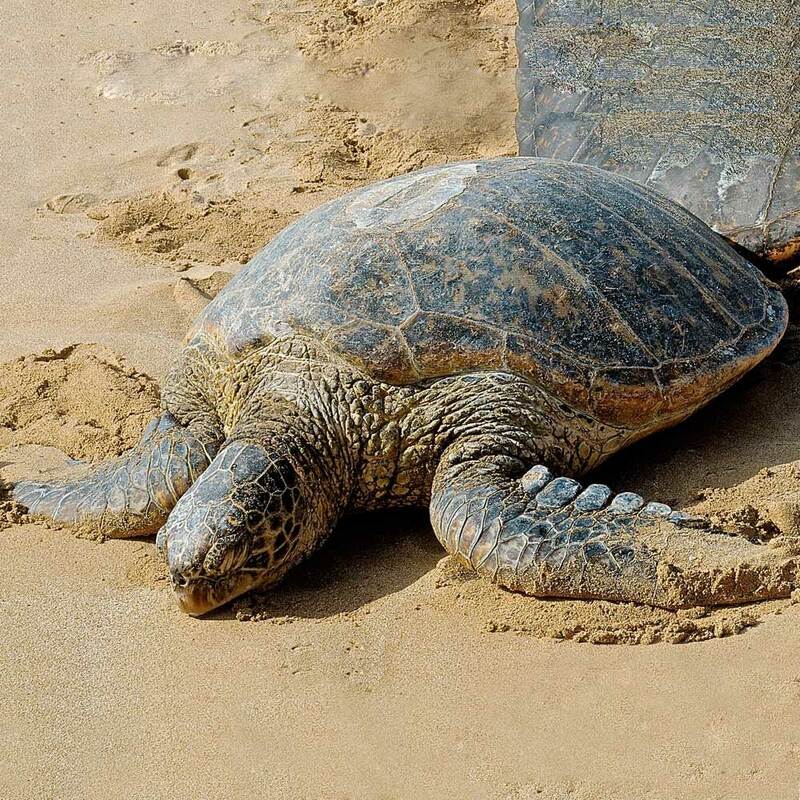 On September 5, 2015, Hao hauled out onto the beach with a severely damaged shell. The NOAA Turtle Rescue team concluded the damage was the result of a collision with the hull of a boat. She was taken to a veterinarian who administered antibiotics and patched her shell with dental epoxy. She was returned to the water off Laniakea on September 8th. 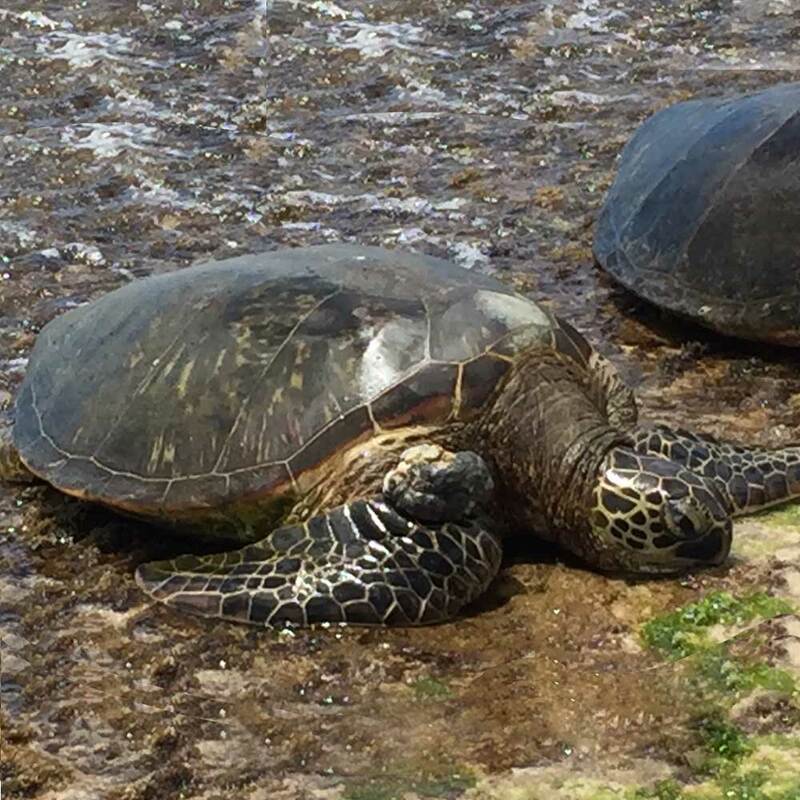 Hao recently took a 15 month hiatus from basking at Laniakea but returned in August 2018 evidencing significant healing to her previously damaged shell. Markings: This turtle has yet to be PIT tagged. JP first appeared at Laniakea in March of 2015. Since then, L-29 has become the most frequent visitor to Laniakea beach. This turtle's nickname, JP, was bestowed in honor of the founder of Malama na Honu, Joanne Pettigrew. Hilahila was the second new subadult turtle to bask regularly enough to be considered part of our honu `ohana in 2015. 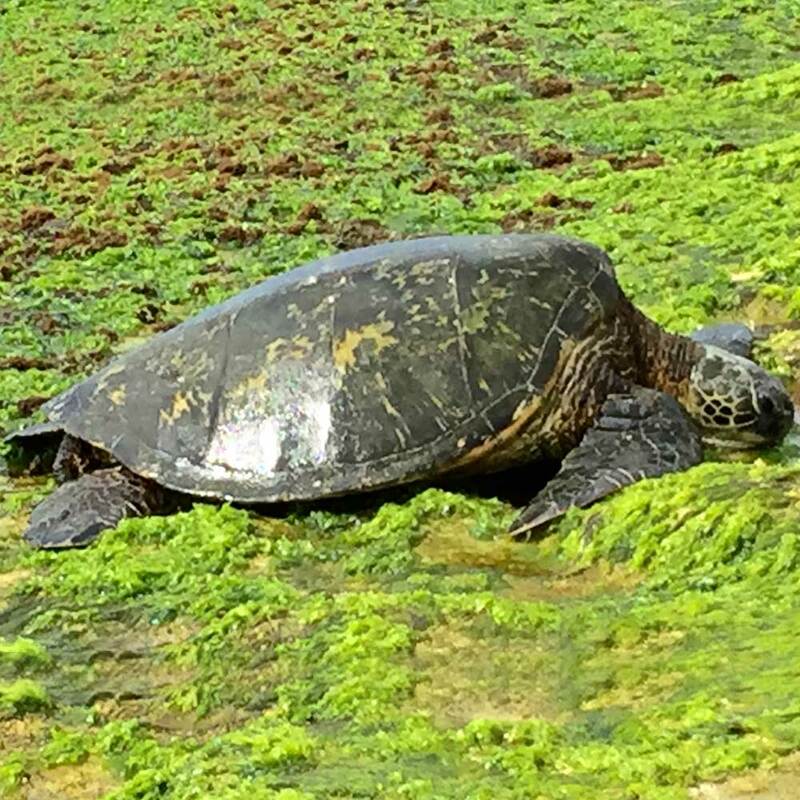 Historical records show that this turtle actually first appeared to bask at Laniakea a couple times in August and September of 2014 but then disappeared for six months until it established a regular presence at our beach in April 2015. L-30 basks primarily on the limestone shelf at the southwestern end of the beach. 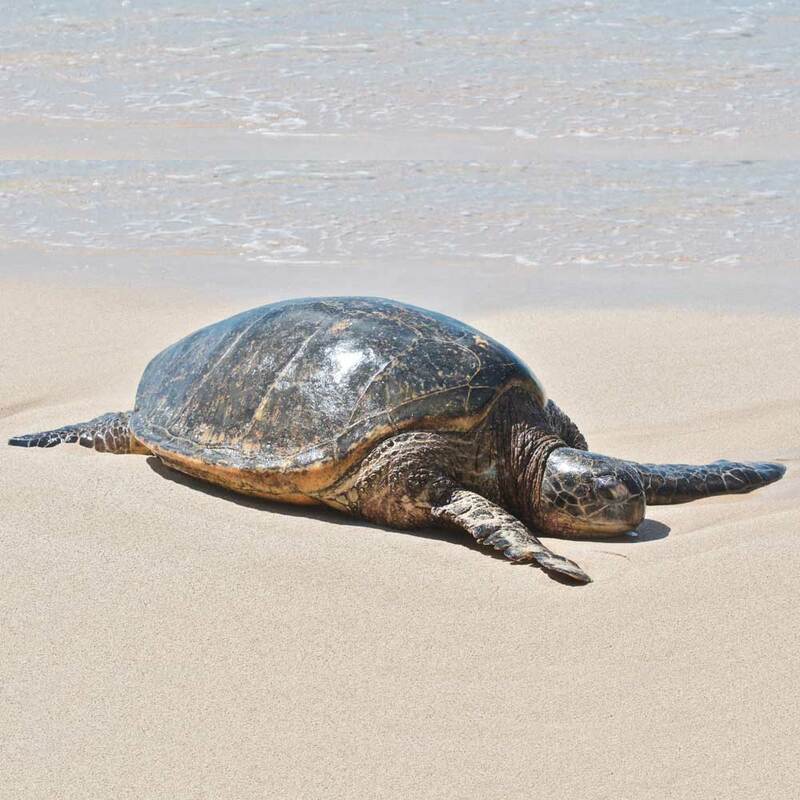 Kaimana, a subadult turtle, was first recorded basking 1 time at Laniakea back in October 2014. After that appearance, L-31 did not return again until late May 2015 and has since continued regular basking activity here at Laniakea from spring through early fall each year. Kaimana's marginal scutes at the rear of the shell exhibit noticeable damage. 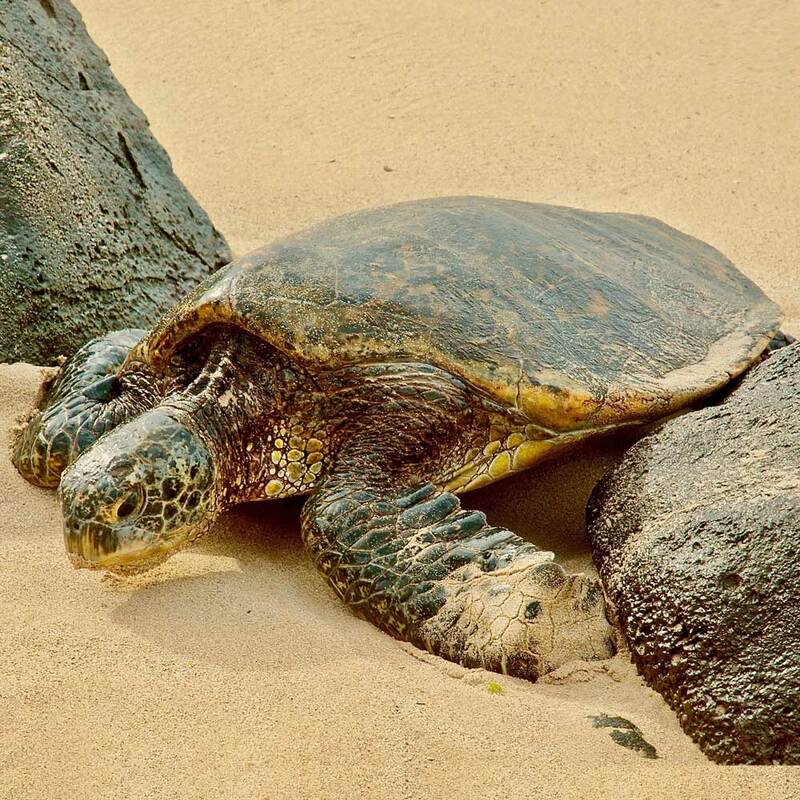 This turtle is another of our honu `ohana that basks on the ledge at the southwestern end of the beach. Kaipua, a subadult turtle, first appeared at Laniakea in May 2015 but did not establish regular appearances until June. L-32 exhibits a medium sized fibropapailloma tumor where the right front flipper meets the turtle's body. This is the first turtle basking at Laniakea to exhibit one of these tumors since Genbu, one of our adult male turtles, was treated and cured of this malady back in 2009. In April 17, 2018, L-32 hauled out onto the beach evidencing significant damage to the rear portion of the shell. The NOAA veterinarian who evaluated the injury concluded that the damage had been caused by a boat propeller strike and that, luckily, there were no apparent internal injuries. This allowed Kaipua to be returned to the waters at Laniakea the same day. Volunteers continue to monitor Kaipua's healing process and periodically send photos to NOAA officials. This injury is healing nicely. Kaipua basks primarily on the shelf at the southwest end of the beach. 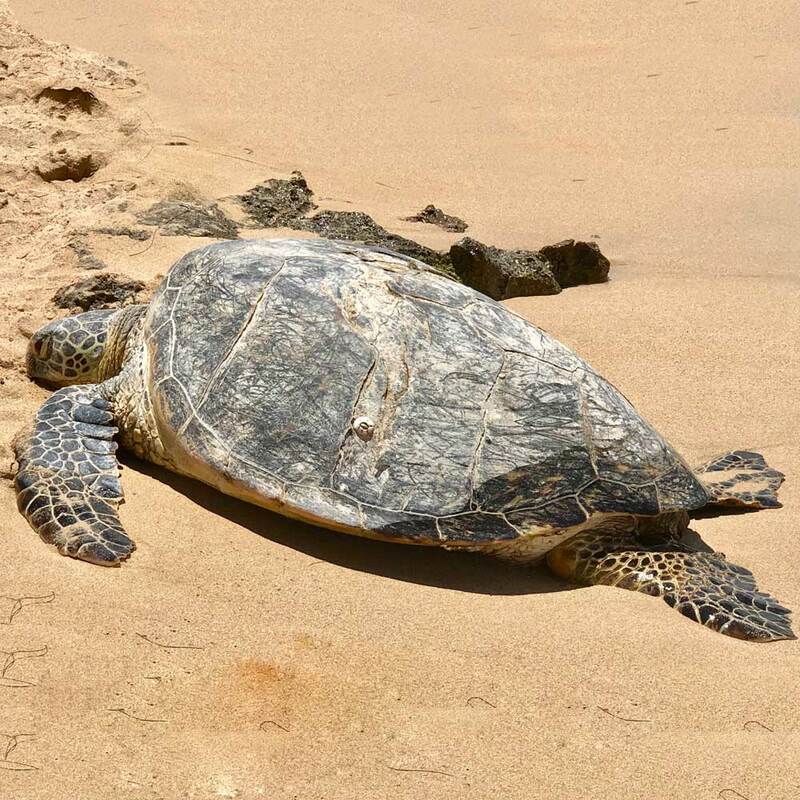 Makana, a juvenile turtle, was first recorded basking at Laniakea in August 2017 and regularly appeared through December before taking a 3 month break. Upon L-33's return in April 2018, the decision was made to name the turtle and include it in the Laniakea `ohana. 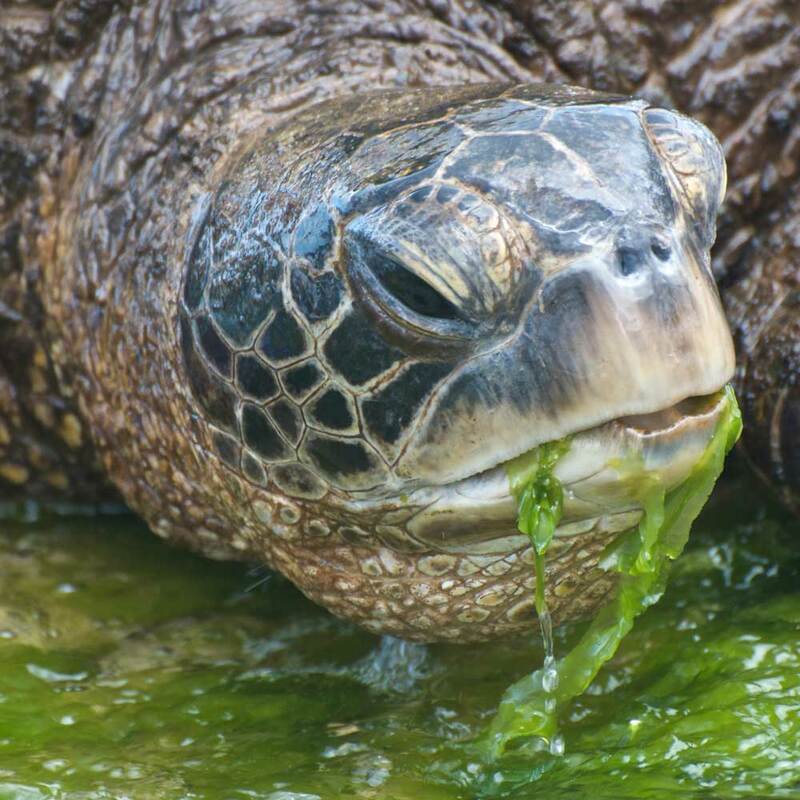 This turtle exhibits a growth in the jaw area on the left side that could be the beginning of a fibropapilloma tumor. Maka Nui first appeared at Laniakea on August 13th, 2018 a little after 4 pm. L-34's first foray onto the beach was impressive as the little one was really wide-eyed, drinking in all the new sights of being on land. Uncharacteristic of new baskers, this turtle reappeared five (5) more times that first week and has continued to haul out quite frequently ever since. Quickly acclimating to being on the beach with gawking human beings around, the duration of this juvenile's time on the beach with each appearance has noticeably increased in the past couple months. Kaheka is our most elusive subadult turtle. 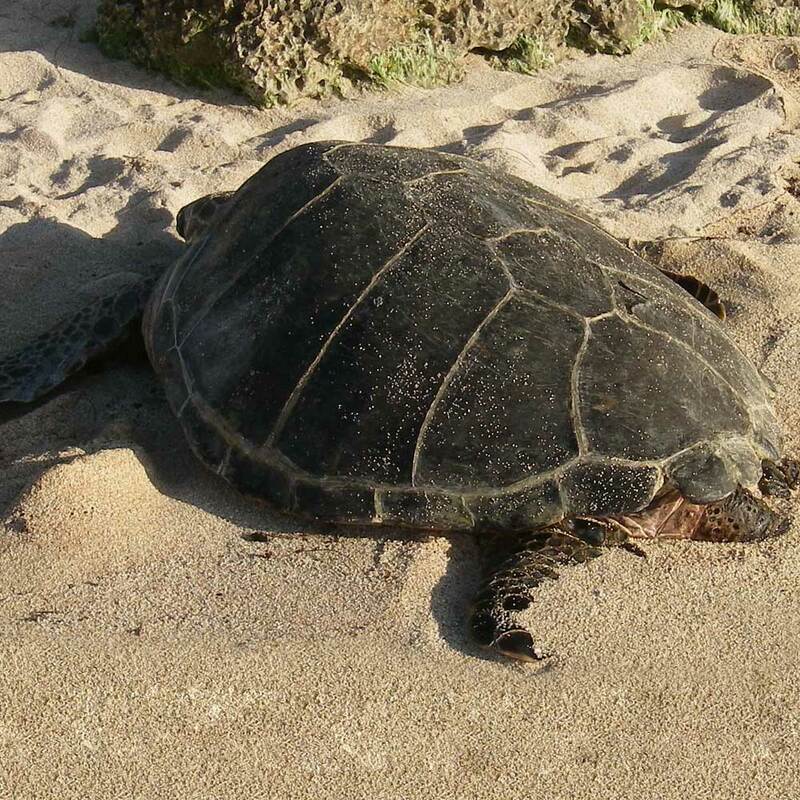 In April 2008 an injured and entangled juvenile turtle was spotted in the tide pool at Laniakea Point. Honu Guardians remained with the small turtle for hours waiting for the NOAA responder. The turtle was taken to the veterinarian in Kaneohe and the fishing line and hook were removed. Seventeen days later, after being treated with antibiotics, microchipped in the back flipper and receiving temporary white " E-4" markings on both sides of its shell for identification purposes, the turtle was released at the Kawainui Canal on the Windward side. Within a week, the turtle was reported back in the tidepool at Laniakea and swimming close to shore. On November 30, 2008 E-4 hauled out onto the beach following L-24 Kuhina, becoming the newest and youngest member of our basking Honu Ohana. Since then, E-4 spends most of its time swimming and feeding in the tide pools at Laniakea Point. The name E-4 comes from two of the last three digits of the implanted PIT tag. 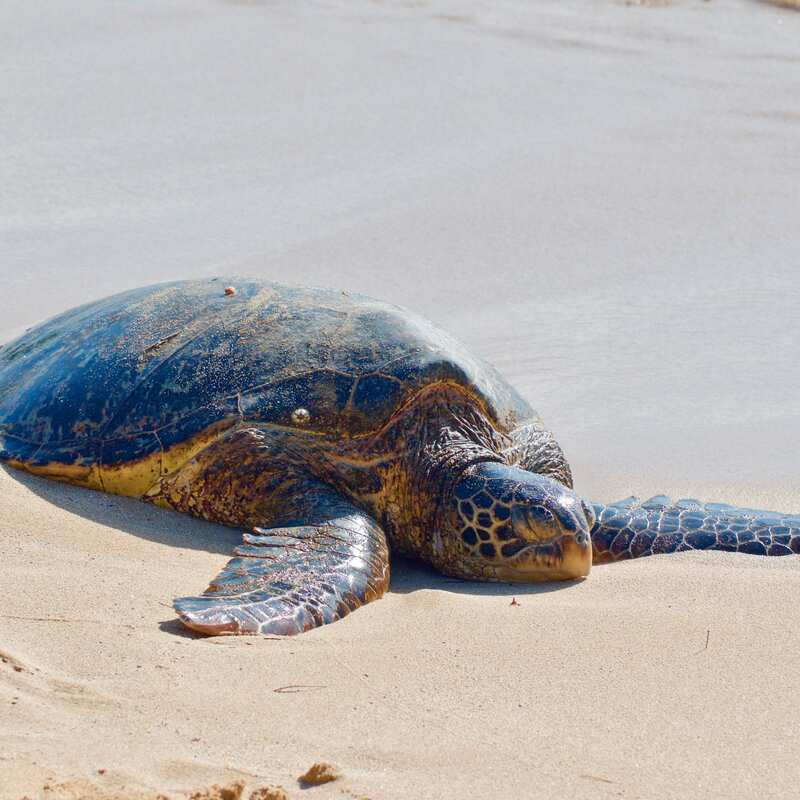 We believe that Kaheka will continue to bask at Laniakea but has not appeared on the beach since July, 2015.